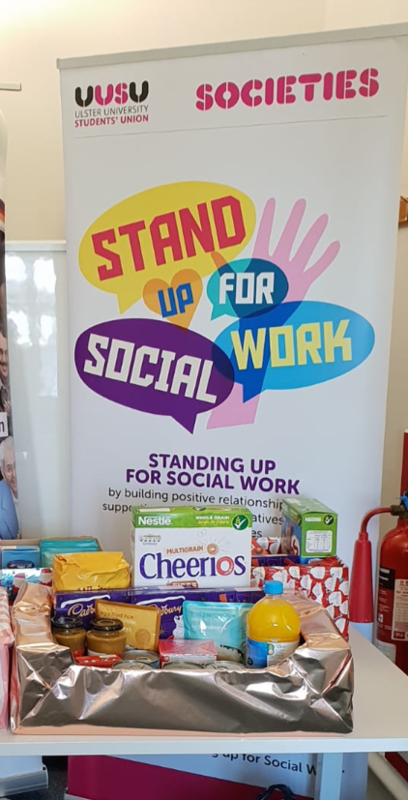 Stand Up For Social Work Christmas Food Bank Appeal! This Appeal supports local families in need facing food poverty especially at Christmas time. Our aim is to put together as many food hampers as possible to donate to families in local areas to make their Christmas that little bit easier. We are trying to raise between £250- £1000 to enable us to gather resources and food to create as many hampers as we can. The more hampers the more families with food on their table this Christmas! 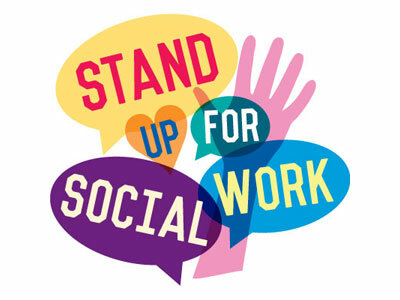 We are the 'Stand up For Social Work' Society. We are a group of Social Work students from Ulster University Magee who want to give what we can back to our community. We are a mixture of ages, gender, background, cultures and personalities all with one aim! There are hundreds of local families living in poverty and worry daily about not being able to feed their family. The majority of us are very lucky not to know or understand how this must feel for these families. Imagine your Christmas being a time of pressure, stress and worry of how you are going to feed your family from one day to the next. We understand that this is not only a worry for families at Christmas time and it can be a daily struggle, however we want to be able to embrace the gift of giving and help these families have one less worry this Christmas. As social work students we have gained an understanding and knowledge of the challenges and increasing needs families face in today's society. This is happening in our local communities with families living just down the street or around the corner, this is not just a government problem, it is a community problem, it is a problem for us all. That is why we think it so important to get this message out there and help raise awareness of the increasing needs and the issue of food poverty. By contributing to this appeal you will be helping those most in need directly. You will be helping to provide breakfast for many children on Christmas morning, you will be giving families the opportunity to enjoy a Boxing Day meal together and you will be contributing to making Christmas a little less stressful for these families. This is important to us and we hope it is important to you too! If we hit our minimum target we will be able to create a few hampers of food for these families. However, we want to go big this year and create as many hampers as possible to reach out to as many families as we can so we would love to reach our maximum target. The dream would be to exceed this target as it really will only provide us with enough to make a small dent in the amount of families facing food poverty. Last year we managed to create 107 hampers....these were spoken for and allocated to families within hours, it didn't even scratch the surface of the demand. This year we would love to go bigger and better and with your help we can do this. Be reassured every penny raised will go directly to the families, we have no running or event costs to cover, purely food to feed the families. We will provide regular updates on the progress of the campaign and the outcomes and inform you how your money has helped. There will be a special event on 6th December 2018 in the Great Hall at the Ulster University Magee campus where we will hand over the hampers to be distributed to the identified families, alongside festive carol singing, tea and buns and Christmas cheer! It would be great to see you there. Everyone is welcome! You don't need to give money to help us succeed! Please share this project with anyone you think would support us on Twitter, Facebook and in a chat over the fence or on your blog. In fact, share it with everyone you know as we think it's a great idea, and the more people who know about it, the more likely we are to make this work! Also we will have donation points throughout the Ulster University Magee campus where you can drop in food items that will be put into the hampers. Keep an eye out for our 'Donation Trolleys'! A special shout out to thank you on social media!